Avenue Q returns to the stage for a UK national tour starting on 25th January in Portsmouth and continuing through to its final date in Belfast in August. Having won the Best Musical Tony Award after its initial opening on Broadway in 2003, Avenue Q came to the West End in 2006 where it ran for five years receiving the Lawrence Olivier Award for Best New Musical. Since that time there have been many world-wide tours of the show, including of the UK, and this latest promises to be a crazy puppet-led kaleidoscope of music, dance, jokes and satirical ditties as coming-of-age themes are explored by the “naughtiest puppets in town”. All indications from the Press Day are that the show will make you smile, it will make you laugh, it will make you think and above all, we are assured, it will make you fuzzy. 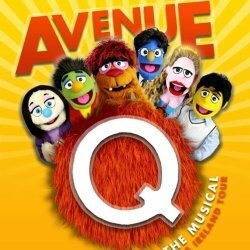 Sired by Sesame Street out of The Muppets, Avenue Q boasts 33 puppets in all, operated by four puppeteers with further characters making a cast of eleven in total. Puppet “Master” Nigel Plaskitt, who coaches the performers, explains that the puppets have to be light and easily maneuverable so that the actors can carry and operate them throughout the full two acts. They, therefore, do not have any mechanical parts and the material used is, well, mainly fuzzy (i.e. fluffy, hairy and endearing). Plaskitt, with a long pedigree in children’s TV, film and stage work, is the go-to puppet-man for any ambitious show of this nature and his attention to detail and affection for his lovable charges (designed by Paul Jomain) is plain for all to see. Focus, is the clue, he tells us: the visible performer-operators have to have exactly the same focus as their puppet characters whether they are talking, singing, walking or dancing. Director Cressida Carré confirmed that focus is all and once that is achieved then the cast and show can really take off. I asked performers Cecily Redman and Lawrence Smith, how difficult this was – they were both new to the world of stage puppets. It was certainly a challenge they said but in the end, it is really just like learning another performance skill – a tricky dance routine, for example. Clearly excited and up for the challenge of this new tour, the two actors, and their fellow cast members are definitely going to take audiences by storm. I cheekily asked them what they thought the puppets did when everyone had gone home and they were left on their own, back-stage: talk about the cast, they said, apparently quite seriously. They’d be discussing their faults and foibles, gossiping about their favourites and not-so favourites. And that, I think, sums up the nature of Avenue Q – the puppet characters do really take on the attributes of humans which is, ultimately, where the charm of the show lies. Alongside distributing fuzziness to the world, that is. Cast includes Megan Armstrong, Jasmine Beel, Ellis Dackombe, Chloe Gentles, Nicholas Mclean, Robbie Noonan, Saori Oda, Cecily Redman, Lawrence Smith, Oliver Stanley and Tom Steedon.